At Sapphire 2010 last week I heard Leapfactor mentioned in keynotes and many other presentations by SAP mobility experts. I saw one SAP VP demonstrating a very powerful iPad application that SAP has in a proof-of-concept that was developed by Leapfactor. I also saw that the SAP iPhone application "SAP EcoHub" (free and available on iTunes) was developed by Leapfactor. I attended a session at Sapphire last week with Mellmo founder Santiago Becerra! Here is how they describe their solution, "Use Roambi to transform your existing reports and data — from a variety of sources — into interactive visualizations and dashboards for the iPhone or iPad. Explore and analyze your data with the ease of playing a video game and the power of an enterprise reporting tool." One of the most interesting things Santiago said was that he favors hiring gamers - developers that have experience developing video games and flashy UIs. He believes they think more creatively and that they will be better capable of developing the next generation of enterprise mobility applications. Now that SAP has enterprise mobility all figured out, it is time to explore opportunities in the M2M marketplace. M2M is a vision of connecting physical things through a network that will let them take an active part in exchanging information about themselves and their surroundings over the Internet. This will give immediate access to information about the physical world and the objects in it - leading to innovative services and gains in efficiency and productivity. There are many ways to describe M2M - the Internet of objects, the Internet of things or embedded mobile devices. M2M is a world filled with remote asset management monitors, wireless sensors, telematics, telemetry, smart grids, and eReaders. 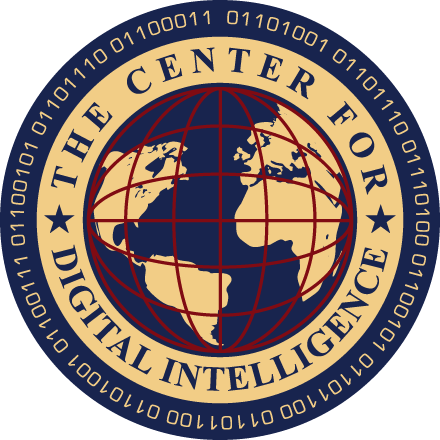 The military describes this world as Network-Centric Operations. 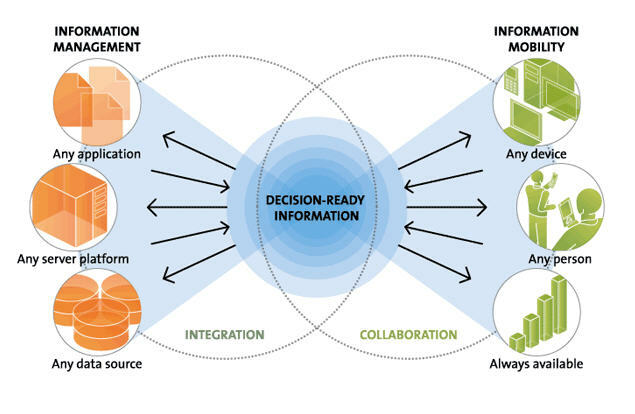 Information sharing enhances the quality of information and shared situational awareness. Shared situational awareness enables collaboration and self-synchronization and enhances sustainability and speed of command. Juniper Research predicts that the number of M2M (machine-to-machine) and embedded mobile devices will rise to approximately 412 million globally by 2014. ABI Research uses a more conservative set of numbers and says that there were approximately 71 million cumulative M2M connections in 2009 and this will rise to about 225 million by 2014. With either set of figures you get a big number. ABI's M2M research practice director Sam Lucero encourages MNOs (mobile network operators) to "come up" with M2M connectivity platforms - robust connected device platforms. These are applications and services that connect all of these embedded mobile devices together into a central management application that turns data into actionable intelligence. Think of it like this - all of these embedded mobile devices are capable of sending data to you. What can you do with it? Where can this data provide value? In addition to sending data, many M2M devices can receive instructions and take action as well. Mobility is more than just people-to-people talking on handsets. Wireless M2M is an entirely new way of thinking. I wonder which one of the mobility vendors in the SAP ecosystem is going to add M2M and M2M connectivity platforms to their product list. I believe this can ultimately be a massive market. I recently read about a GSMA prediction that M2M connected devices could ultimately reach 50 billion. A dollar a device per month would suit me just fine. Have you ever worked on an M2M project? I would like to hear about it! Here is a related video I recorded on M2M. I had the privilege of meeting and interviewing (with a digital video camera) Bruce Johnson, President of Sky Technologies, America, about his thoughts on SAP and enterprise mobility. 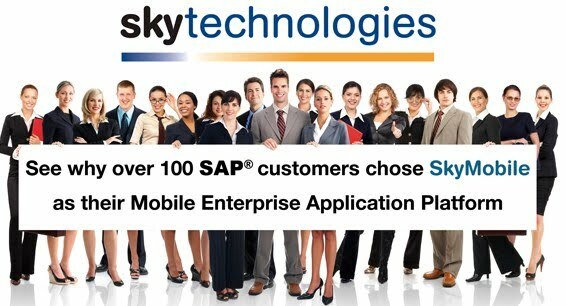 Sky Technologies describes themselves this way, "Sky Technologies specializes in Enterprise Mobility for SAP®. 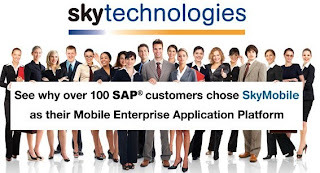 With a strong focus on innovation, Sky Technologies has developed SkyMobile, a SAP Certified Mobile Enterprise Appliaction Platform (MEAP), which enables any SAP process to be mobilized on any type of smartphone device." Jon Reed, an SAP Mentor, and I recently worked together on 2 articles that were published on ERP Executives the magazine for SAP Managers. He is a great writer and contributor to the SAP community. Last week at Sapphire was a fun learning experience. I met with just about every mobility company in the SAP ecosystem and had a chance to record video interviews with most of them. I will be posting new video interviews with mobility executives all week so check back often. SAP did a dangerous thing at Sapphire 2010. They placed HD video cameras in the hands of SAP Mentors. I should call this series the "forehead" series since I seem to highlight my forehead in these interviews. Oh well, it's a nice forehead. I'll do better next Sapphire... I hope you find this series of video interviews with SAP mobility experts informative. For more in this video series click here. I believe the saying, “content is king!” Although I would add that “content and business processes are king!” Applications that add unique functionality and value to the SAP ecosystem will have longevity. Companies that are only providing interesting views of existing SAP data are subject to being quickly replaced by the next teenager with a cooler UI. Mobile applications developers must add deep value to be able to gain mindshare and then defend their positions in the longterm. They need to demonstrate unique innovation, deep expertise, and extend value in manners that are defensible. 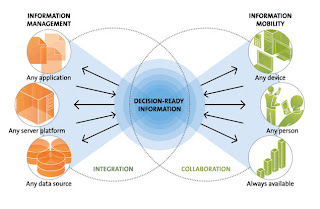 The term "mash-up" is used often at Sapphire to refer to aggregating data from multiple sources. This is a very interesting concept. Pulling data from many different sources to add unique value on mobile applications that are geospatially aware. This is interesting. I have seen some absolutely fantastic mobile applications at Sapphire that help companies make collaborative decisions and harvest enterprise's institutional knowledge. These are mobile knowledge and decision management applications. This is a very interesting area to me. It is new value. Not mobilized versions of existing SAP systems. I have heard and witnessed a lot of chest thumping at Sapphire. The bottom line is how many SAP customers does a vendor have in production. Mobile micro-applications are being labeled as "instant value" applications at Sapphire. I like this description. It is good marketing. Inspections, assessments, asset management and field services are still very interesting areas as there is yet a lot of new value that can be created and provided on mobile devices. Sybase is not known for their mobile applications. They are a great mobile middleware company. It will be interesting to see if they can compete with the incredibile mobile applications that I have witnessed here at Sapphire from ecosystem partners. There is a persistent rumor that HP may try to outbid SAP for Sybase. Crazy times! Add these highlighted statements to SAP's co-CEO Bill McDermott's, "We see a huge emerging market for the real-time, unwired enterprise," and SAP co-CEO Jim Hagemann Snabe's, "We want to make sure that SAP solutions can be accessed from all leading mobile devices." I see the fog beginning to rise. The Sybase acquisition can ensure that a standardized way of integrating mobile devices and mobile enterprise applications with SAP systems is defined and available through Sybase's mobile middleware and integration tools. I spoke to an unnamed source in SAP who confirmed this statement with two taps on the table. This same source said there will always be choices in how to integrate, but there will be a defined SAP way for mobile software providers to integrate. SAP must have read my blogs. I read and interpret that SAP believes mobility, mobile device support, and integration with mobile applications is too important to leave totally up to the discretion of partners. SAP wants to bring order to the chaos and define a path, methodology, and strategy for their partners. On the question of where SAP's current mobility partners fit into this new world order, SAP's Rothenstein provided this statement, "SAP’s intent to acquire Sybase will expand opportunities for our joint ecosystems and we believe our software and implementation partners can capture new opportunities by innovating on Sybase’s open and market leading mobile platform." The SAP statement above seems clear. Mobile software companies that develop "rich or thick mobile clients" in the SAP ecosystem will want to seriously consider embedding Sybase's mobile middleware, synchronization, integration, and device management technology in their future mobile software upgrades to better align with SAP's future direction. I have had a chance to talk to a number of SAP's mobility partners in the last few hours who, after they digested the announcement, seem to have embraced it. To summarize (as I will blog more on this soon), they see incorporating relevant pieces of Sybase mobile middleware into their solutions, but continuing to see themselves as the subject matter experts on complex, tactical, and industry specific mobile applications. One last thought for today (as my irrigation system needs to be activated before I leave for Sapphire) is that SAP seems to really be emphasizing the "support for all mobile devices" theme. This is very different than last year when there was a specific emphasis on RIM products. SAP's annoucement that they intend to acquire Sybase is still rumbling in my sleepy head. Several years ago when I was the CEO of a mobile enterprise application company, I partnered with Sybase/iAnywhere. As a result, I have a deep appreciation for both their strengths and their weaknesses. I believe this acquisition or a similar one was inevitable, as SAP has been highlighting mobility since last December, but the timing still took me by surprise. I expect that events and presentations at Sapphire will bring clarity to this move, but in my current fog of confusion I give you my thoughts. I have been recommending for some time that SAP should own the mobile integration layer. Variations of this have been called Gateway, DOE, NetWeaver Mobile, etc. I think this move will clarify in the future how mobile applications should integrate with SAP. 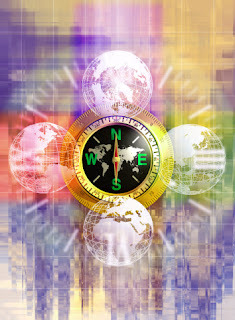 "We see a huge emerging market for the real-time, unwired enterprise. With this strategic move, SAP becomes the number one provider in this market, a significant first mover advantage for our strategic growth ambitions," SAP co-CEO Bill McDermott. "This acquisition falls right in line with our three pillar strategy of on-premise, on-demand, and on-device software…Now, with the acquisition of Sybase, we will secure our leadership in on-device, further cementing our ability to bring information to users anytime, anywhere, and on any device. As mobile applications for consumers have changed the world, the way people live and communicate mobile applications for the enterprise will have an equal profound impact in the way they work. We want to make sure that SAP solutions can be accessed from all leading mobile devices," Jim Hagemann Snabe, SAP co-CEO. "Mobile computing is an unmistakable and profound shift in the market. Sybase will be our platform to support all mobile devices, including Windows, Blackberry, Android, and others," said Vishal Sikka, SAP’s Chief Technology Officer. Credit Suisse analyst Peter Goldmacher noted that SAP levered up to pay $5.8 billion for a $400 million business (Sybase’s mobile pieces). "While the dream around mobile is big and Sybase is the undisputed leader, it is going to take a long time before the mobile business can move the needle for SAP. There is a smaller near term opportunity within SAP to mobile-enable a portion of its existing ERP apps," says Goldmacher. The problem with Goldmacher's comments on near term opportunities is that Sybase does not have many mobile ERP apps, SAP's mobility partners do. This will need to be worked out very fast. Dennis Howlett in his article, "SAP acquires Sybase for $5.8 billion, but why?" echoed the questions I asked yesterday. On the subject of custom application development he asked, "Does SAP think that Sybase and in-memory gives them an entree to this massive market [Telcos and Financials]? If so how does it plan to manage all the integrations required? Where is the rapid apps development environment [for mobile applications] that would make SAP a natural choice?" While this move by SAP may be a good long term move, it introduces a host of near-term problems for customers and partners. 2010 is the year of mobility at Sapphire. The exhibition floor is filled with innovative and powerful mobile application vendors that have invested in SAP partnerships. What does this move mean for them? They have powerful mobile applications today, where I see Sybase as a longer term play not a 2010 or even 2011 answer. SAP needs to immediately clarify their recommendations for what customers should do today to address their mobility needs or risk introducing sales and market paralysis. Sybase does not have a user friendly, graphically rich, template based rapid application development environment for enterprises or systems integrators to develop mobile enterprise applications. It requires deep programming skills and knowledge to utilize their mobile middleware. I know as I have used it. What does that mean? 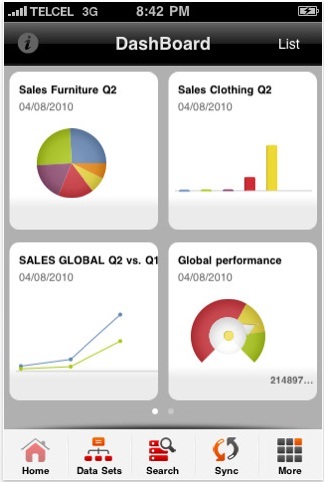 There are very few mobile enterprise applications available today from SAP/Sybase. The innovation in mobile applications is coming from the likes of Vivido Labs, Leapfactor, Sky Technologies, ClickSoftware and Syclo, all of which are SAP mobility partners and have booths at Sapphire this year. Syclo is a key co-innovation mobility partner with SAP. What does this announcement mean to them? Their Sapphire focus and messaging likely changed yesterday. SAP customers need mobile enterprise applications now. How does this acquisition help? It doesn't in the short term. You can bet that all SAP mobility partners are gathered in small rooms with whiteboards today. They are likely to be grumpy at Sapphire from lack of sleep. There is an ABSOLUTE need for rapid application development tools and environments to help design, development, test, deploy and support rich or thick client mobile applications without significant programming. These tools are available today from SAP mobility partners like Sky Technologies and Syclo. These tools will need to be expanded to incorporate some of the mobile middleware functionality that the Sybase acquisition will bring to the table. Sybase is not known for their mobile applications. They primarily license mobile middleware and mobile databases to companies that develop mobile software applications. SAP users need mobile applications. Mobile applications, not mobile middleware, provide the ROIs customers seek. Sybase/iAnywhere has been arguing for years internally on whether to develop their own SDK and enterprise mobile applications. In the past they have chosen not to so as not to anger their OEM clients. In fact, they only had a very small professional services team to deliver custom mobile applications. I don't see Sybase/iAnywhere suddenly being the mobile enterprise application company. They are very technical types who can ramble for days on the value of their synchronization, but have little insight into user interfaces, business processes and mobile applications. This can change, but this has been my experience. Companies looking for mobile solutions should not expect to find them in the SAP/Sybase acquisition. The ready for market mobile enterprise applications will be available on the show floor at Sapphire next week. SAP's mobility partners, those that develop thick or rich mobile client applications, may find value in aligning their future mobile middleware strategies to take advantage of the new SAP mobile middleware offerings. However, this will be an infrastructure alignment and the end customer should not see much of a difference. SAP mobility partners, that offer mobile micro-applications with rich user interfaces and experiences, are unlikely to see much impact in the near term from this acquisition. I expect that SAP will provide a more standardized approach for integrating mobile applications and mobile device management into their ecosystem over time, but again this is not likely something that a customer will notice immediately. Changes like this are mostly done behind the scenes. SAP has been pondering how to best monetize mobile applications that integrate with their ERP environment. Sybase has this down. They have been embedding mobile databases and mobile middleware and charging a per device fee for many years. 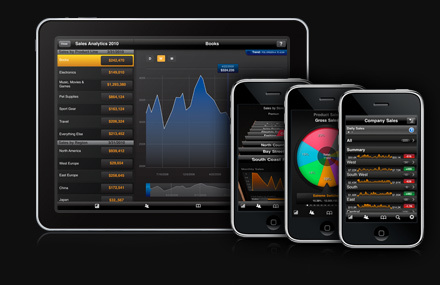 They will likely be able to influence how SAP monetizes the mobile environment going forward. There was a reason SAP had a partnership strategy for mobile applications. There are literally thousands of different mobile applications that different business applications, industries and markets require. SAP cannot possibly supply them all. They have the responsibility to standardize the way these mobile applications interface and interact with their ERP environment, but they must depend on the ecosystem to fulfill the demand. This has not changed. Sybase does not bring a large inventory of mobile applications. SAP's mobility partners will likely remain the source of tactical and industry specific mobile applications both in the near term and in the long term. I will have better analysis after pondering this announcement for a few days, but here is my first, off-the-cuff thoughts. SAP will instantly be a leader in mobile middleware with this acquisition, but this acquisition does little to solve the needs of large enterprises today. Sybase is not a mobile application company. They have great mobile middleware, mobile databases, synchronization and integration technology and mobile device management. However, none of these products provide a company with a mobile applications that solves their problems. A database is not an application. Synchronization is not an applications. Mobile device management is not an application. All of these solutions are just pieces that offer no value unless somebody builds something with them. Who will that be? Sybase does not have a SDK. How can a large enterprise with custom mobility needs build an application? Sybase tells them to go pick a programming environment of their choice. That does not help make developing mobile applications easy! Sybase does not make it easy for systems integrators to deliver mobile applications either, since there is no SDK. Afaria is a huge, an even obese mobile device management system. It can do anything and everything you can ever imagine. I once had a consultant tell me that the training class for Afaria was like 3 or 4 days long and was overkill, overkill, overkill! That is far more device management than 99.9% of the world wants in Afaria. I love Afaria, it is just so very expensive and complex. I just got off of the phone with Bonnie Rothenstein at SAP. She works in the enterprise mobility group at SAP. She is arranging meetings for me with all the right people at SAP to get the latest news and updates on enterprise mobility. I will be posting updates to this blog as often as I can next week. Bonnie was sharing the extensive list of presentations, demonstrations and sessions focused on enterprise mobility that will be available at Sapphire this year. The list is long! I am very excited about the focused efforts around enterprise mobility that I am seeing from SAP. I will be attending as many of these mobility related events as my schedule allows. Look for me in an SAP Mentor rugby shirt, #45, at these events and introduce yourself! If you can't make Sapphire this year, but want a full recap of the developments in enterprise mobility after Sapphire, please contact me to schedule a time to discuss. I read an interesting article today on SAP's SCN that announces mobility will be a key focus of SAPPHIRE 2010. Here is an excerpt, "We are in the midst of what might be described as a smartphone revolution. It is clear that SAP has also accepted this." In an independent analysis, Bob Evans wrote a piece (Information Week, April 30, 2010) titled: "Inside SAP: 10 Factors Behind Its Dramatic Turnaround." In this article, he calls out "Making Mobile Matter" as one of these 10 factors. He quotes J. Snabe, co-CEO, SAP AG, as saying that SAP is committed to making sure that "SAP solutions can be accessed from all leading mobile platforms, like RIM, Nokia, Apple, Google Android, etc." SAP's co-CEO Jim Snabe has made enterprise mobility a key priority of SAP. More than a dozen mobile applications that integrate with SAP will be demonstrated at Sapphire this year. 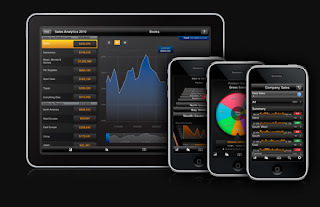 2010 is an extraordinary time to be involved in SAP enterprise mobility. If you would like to learn more about SAP enterprise mobility please join the Linkedin group of the same name or contact me. I will be available, as an SAP Mentor, in the Orlando Line of Business Area on Wednesday, May 19th from 2-3 pm to discuss SAP enterprise mobility with anyone interested in that subject. See you there! I must admit it is a self-proclaimed year of mobility, but I believe it is appropriate. I think enterprise mobility will be front and center everywhere you go at Sapphire next week. There are many new and innovative mobile micro-applications that were launched last week by SAP partners. SAP appointed me to be an SAP Mentor this year focused on enterprise mobility. If any of you will be at Sapphire and would like to meet with me please contact me. I read an interesting interview with SAP co-CEO Bill McDermott today in InformationWeek called Global CIO: Even Oracle and SAP Agree: The Tactical CIO Is Dead. In the article McDermott is quoted as saying, "I have to say that with respect to CIOs, we have tremendous respect for them and their management and IT overall—but the business world has reached the point where if [the CIO] can't have a conversation that goes way beyond technology stacks to roadmapping business strategies and creating growth, those CIOs are just not gonna be relevant." He then added, "For any IT project, hitting budget is okay and finishing on time is okay but what decision-makers really want is value--they want to know that these IT projects are going to steadily increase the company's ability to grow." As an SAP Mentor with an enterprise mobility focus, I always consider the implications for SAP enterprise mobility when I read statements like McDermott's above. I can see many implications of his comments. I mentioned in an article last week the idea of a "me too" mobile application. These applications will only help you keep up with your competitors, but are not going to provide you with competitive advantages. Competitive advantages come from thinking ahead of the adoption curve and finding new ways to create value by using new and existing technologies. Integrate business intelligence with geospatially aware mobile applications and put them in the hands of your customer facing teams. Use real-time business data and business intelligence to provide just in time advice to onsite sales teams. Implement a network-centric approach that collects real-time business data from all data sources to provide a comprehensive view of your customers' business ecosystem and push it out to your mobile sales and service force. Provide actionable intelligence and advice that can be used immediately to produce more sales and happier customers. Integrate video and audio training into your mobile applications to provide a consistent high quality product and service. Integrate social networking technologies and strategies into mobile applications that enable your company experts to be easily available to the mobile workforce. Leverage your experts at the point of work in a scalable manner. Reduce the amount of time wasted waiting for answers from your experts. Put business process diagrams on the mobile device so mobile workers can understand and view the role they play in the process. Animate the business process diagram so mobile workers can view the progress of approvals, orders, shipments, etc. Make the mobile worker feel part of the process not a lonely outpost guardian. Provide mobile views of transactional content. This is content associated with a business transaction. Show status of orders, shipments, GPS locations of products, delivery schedules, etc., in a comprehensive view on a mobile device. Think of the time it would take the sales team to track all of this information down. Anticipate the sales team's needs and push it out to them one hour in advance of a customer meeting. Identify all administration processes, whether paper-based or those requiring online connectivity, that uses up your mobile workforces' productive selling and service time. Consider mobilizing these processes with mobile micro-applications from SAP partners Vivido Labs, Leapfactor or Sky Technologies so more administrative tasks can be completed during non-productive times. The result should be the ability to be more effective and efficient. Identify transactional content events that your mobile workforce should know about to make them more productive and effective. Push this information out to the mobile workforce in the appropriate context so actions and reactions can be instigated. As McDermott said, CIOs must look beyond IT project management to adding company value and growth. There is huge potential for both growth and value in enterprise mobility. The value is not necessarily realized just from new technologies, but the leveraging of existing technologies and systems and then extending them into mobile environments in time sensitive, contextually appropriate and geospatially aware manners. Even the largest enterprises in the world may only have the need for 200 users of a particular custom mobile enterprise application. For example, I worked on an enterprise mobility project in China that was incredibly complex and expensive to develop and the maximum number of users was about 200. 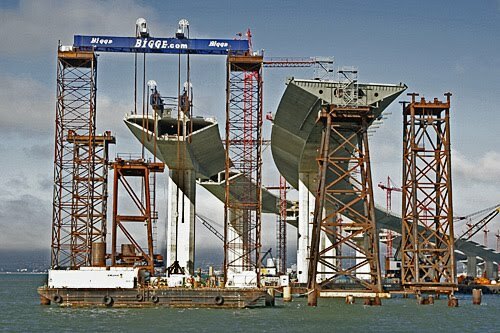 The solution enabled a government agency to receive real-time quality inspection data on a massive bridge project. They wanted each section of steel to be uniquely identified for quality purposes and the data stored in an archive with the government agency. The engineering firm requested that my team develop the mobile application on a MEAP. I sent my team to China to work on the requirements for a few weeks. The solution was incredibly challenging to develop, but the end product was a work of art. Here is my point - this mobile enterprise solution was very expensive to develop, but worth every penny to the customer. 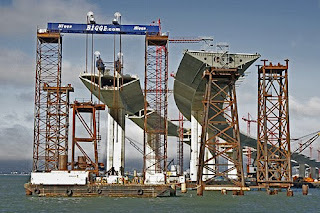 The solution enabled the engineering firm to be compliant to government requirements on a project worth over $5 billion. These types of customized mobile solutions, although very important, will never be developed for the masses. These types of development projects need a MEAP with a powerful SDK (software development kit) so that changes in requirements can easily be made in the future by the users or by other developers. Custom mobile applications should be developed using a software development kit in a MEAP. MEAPs will help future proof the mobile application by keeping up with changes in mobile operating systems and standards, while providing a development methodology and tools to speed up and manage development efforts. In addition, integration, device management and production environments can all be managed using defined and documented processes. It appears there are at least six unique mobile solution models. This is a dynamic list, a work in progress, so please help me understand other models that need to be added. Mobile middleware - often includes a mobile database, a server database, synchronization, and basic database integration tools and general guidelines for using the middleware with your software development projects. Typically, you develop in the programming environment of your choice (e.g. .NET, PowerBuilder, C++, Visual Basic) and integrate, the mobile middleware into your applications. Mobile browser applications - these are light weight browser based applications that often provide a mobile view into a back office business application or database. They do not provide access to the data collection tools and functionality available on many devices. SEAP Infrastructure (I made this up) - smartphone enterprise application platforms - supports the testing, deployment, integration, and operations of mobile micro-applications often in cloud computing environments (although on premises versions are also available). Mobile micro-applications may be developed for the iPhone, Android, and BlackBerry devices, etc., and downloaded from online application stores, but integrated to back-end ERPs via the SEAP Infrastructure. SEAP Infrastructure Plus - see number 2 and then add an SDK for rapidly developing mobile micro-applications that work with the SEAP infrastructure. MBA - mobilized business applications (made it up again) - shrink wrapped or off-the-shelf mobile clients for existing business applications. The MBA can often be configured to match the basic customization of the integrated back-end business applications, but it is not designed for general purpose mobile applications. MEAPs - mobile enterprise application platforms - this is an enterprise class mobility platform used to support multiple mobile applications, disparate databases, different business processes, a wide range of mobile devices and operating systems, includes a comprehensive SDK for developing mobile applications and mobile device management. It should be able to support mobile micro-applications and thick client mobile architectures. There is a lot of noise around enterprise mobility today. It is important to understand that a typical enterprise could realize solid ROIs by mobilizing dozens of different business processes. IT departments may be receiving requests for mobile applications from the sales department today, but tomorrow it will be a dozen other departments all with different mobile device preferences and priority business processes. The IT department needs to aggressively formulate a support and management plan that is flexible enough to satisfy a wide range of requests, requirements, and mobile devices before chaos reigns. Many companies will be followers and simply want a "me too" mobile application that mobilizes common business processes, but others seek competitive advantages through mobile technologies. These will seek to utilize mobile technologies in unique ways where shrink wrap applications do not exist. These aggressive inventors and early adaptors want to control their own destinies and be able to develop mobilized business processes only they have conceived. These inventors don't want to be reinventing the wheel. They want to spend their time developing visionary applications with massive ROIs. They want a powerful MEAP to take care of all the mobile middleware infrastructure, integration, synchronization, security, and development infrastructure, but they want an SDK included that enables them to design, develop, test, deploy, and support a wide range of customized mobile applications and business processes. Mobile "me-too" applications help you maintain the status quo. Putting the power of a comprehensive MEAP in the hands of your brightest minds can be game changers. One of the key reasons SAP is following a partnership strategy for mobile applications, I believe, is that they realize they cannot develop all of the mobile applications that are being requested fast enough. A partnership strategy enables dozens of SAP partners to fulfill the demand and enables the SAP ecosystem to compete with each other to make the most powerful and innovative mobile solutions possible. However, just as SAP realizes they cannot solve all the mobility needs of the market themselves, neither can the mobility vendors. Mobility vendors must target the largest and most common business processes for mobilizing, as this is where the quickest and easiest sales revenue is located. As a result, niche mobility applications that may provide a particular company with an enormous competitive advantage will be necessarily ignored. The only way a company will realize the value of that competitive advantage is to implement it themselves. That introduces another discussion which we will continue in Part 2. For people with HIV/AIDS in developing countries like Ethiopia, Cote D’Ivoire, Kenya, and Ghana, receiving AIDS mediation in a cost effective, secure and reliable manner is critical to saving the lives of millions. In addition to the health crisis, the geographical challenges of trying to care for patients that live in remote villages where access to medical facilities is minimal is a huge obstacle. Ensure the secure transfer of drugs. Provide visibility and transparency to participating agencies. Automate ARV drug processes that provide a rapid, regular, reliable supply of medications to patients. Provide a transactional record of the ARV drugs and test kits at every key point in the distribution chain. The bottom line goal was to provide a truly mobile chain of custody system that could extend across a challenging geographical landscape with minimal technology infrastructure. How was this goal accomplished? The answer - by implementing a MEAP solution that enabled delivery drivers to utilize a mobile application designed to work in a disconnected or connected model. The application leveraged the power and flexibility of an enterprise quality mobile database in a thick mobile client that enabled the delivery drivers to maintain inventory counts, accept proof of delivery, and store key data on a consumer grade PDA until they could be connected with the internet at a later time. Prior to implementing mobile solutions, agencies were only able to track drugs to a warehouse located in the larger cities in many countries. Now delivery drivers are supplied with a mobile application that can track the delivery and re-ordering of ARV drugs from the warehouse, to regional distribution centers, to area regional centers and finally to the patient. Every time the ARV medications change hands, a digital record is made of the transaction. The information collected is synchronized back up the chain where program managers can actively manage the continual flow of mediations. Since implementation this mobile solution has helped over 50,000 AIDS patients receive treatments in the Ivory Coast alone. This, coupled with the fact that the mobile solutions decreased the delivery cycle from three months to as little as three weeks, has caught the attention of many other countries and relief organizations around the world. These thick client mobile applications that operate in a connected and disconnected mode are critical to these kinds of environments. Many organizations are looking at using MEAPs and thick client applications to offer better and more timely treatment to those afflicted with AIDS. In the SAP ecosystem Sky Technologies, Sybase, and Syclo are the SAP mobility partners that seem to focus on supporting custom mobile applications with MEAPs that operate in both connected and disconnected modes using a thick client architectures. By thick client I mean a mobile application that can operate with or without connectivity and that includes a mobile database for storing data on the device while waiting for synchronization. In my opinion a good MEAP should have an SDK so that the IT department can utilize it to update and edit mobile applications and develop new ones. Without a good SDK that the IT department can learn, the enterprise is hostage to the vendor. The world of mobility is moving far too fast, and the IT department needs to be able to update and upgrade mobile applications on their schedule not the vendors. Mobile micro-applications and mobile browser based applications are valuable and provide significant ROIs in many situations, but they cannot support the rugged environments described in this case study and would not have saved thousands of lives like the thick client mobile solution that was used.